Does all the information here make your head spin? Don’t worry. We provide you with the most reliable information available on bending tube, choosing materials, picking out die sizes, and understanding enough about the engineering behind tube bending and chassis fabrication and safety. Give this page a read and e mail us with any questions you have. Feel free to link to this page or any of our other tech pages as technical resources. We will not change the web addresses. Do not copy and paste the info or pictures from this site without providing a link to this page as credit for the source. 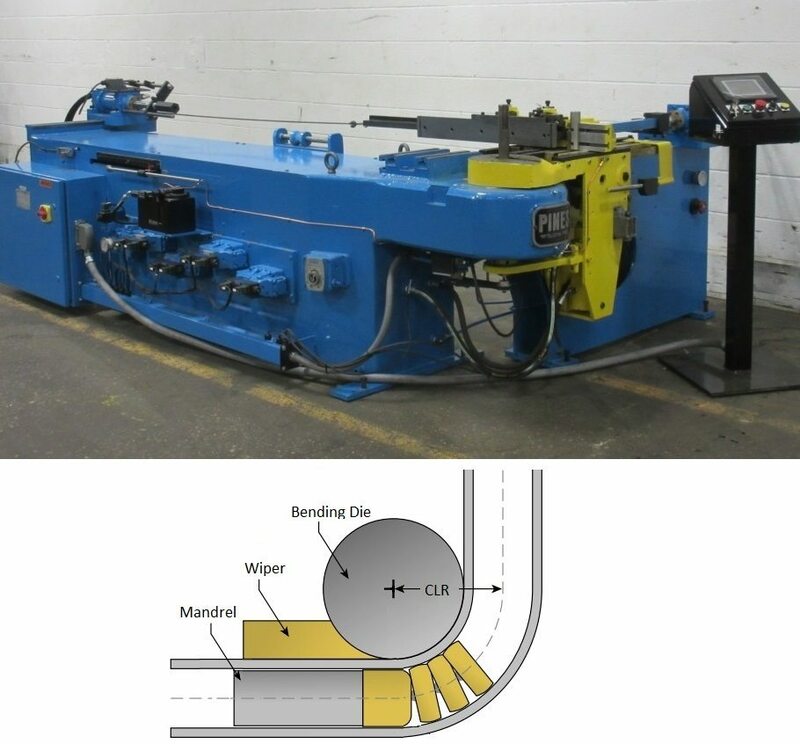 Before you buy a tubing bender, you should know what range of machines are made, and their relative costs. We do not want to sell you our excellet machine if it isn’t the right solution for your needs. These benders press a center die into 2 pivoting shoes (or 2 wheels on really cheap examples). They indicate bend angle coarsely (if they indicate bend angle), and they are only suitable for thick walled soft pipe or exhaust pipe in some higher end machines. The exhaust pipe bent on this style of bender is deformed a significant amount in most cases and is suitable for most OEM or average and low performance applications. Fully tooled machines start at around $5k. The cheap “A-frame” bottle jack benders are a compression bender, but can’t do exhaust work, just plumbing pipe (and they’re real cheap, like $150). Ram exhuast benders like the one pictured are ideal and very common in muffler and exhaust shops doing repair work. Photo Credit: Bend Pak and Harbor Freight. 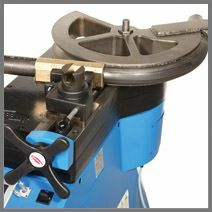 The Rogue Fabrication Model 600 tubing bender is a rotary draw tubing bender, and is extremely versatile. This machine can be up and running in your shop bending tube for about $800 USD including shipping, hydraulics, and a 180 degree die (depending on options). Unlike every other machine the M600 competes with, this machine can actually grow with your shop. You can upgrade the machine with faster hydraulics, an adjustable auto bend stop, specific pressure dies for unique bend geometry and specific materials, a thin wall attachment (TWA) and a backstop assembly for making repeat bend spacing. We also just released an affordable mandrel attachment as well, further expanding the thin wall capacity and improving bend quality over other similar benders. There will never be a more affordable or more versatile machine to start your business with. This is the economical option. You can upgrade the frame to our thicker xHD frame (overkill unless you are bending 2.00 x .250 DOM! ), chose the die you want, choose assembly if you want it to arrive ready for work, etc. 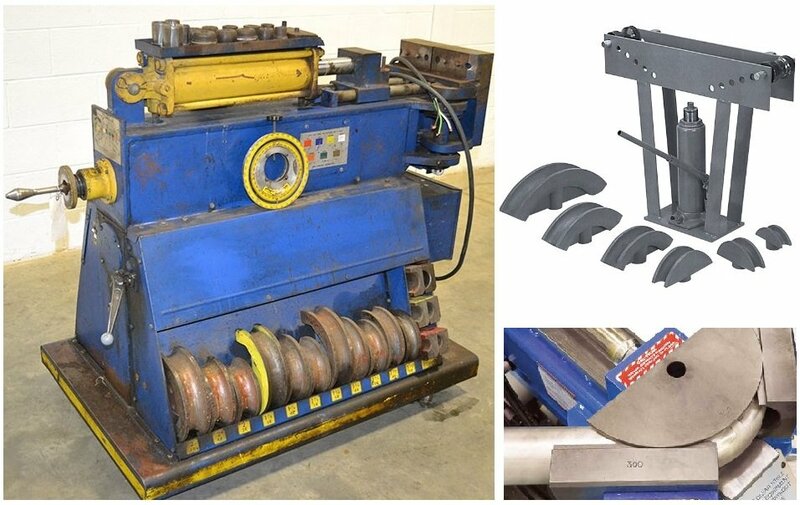 You can also upgrade the die that comes with the machine to have pressure rollers, which makes the machine a little easier to use and more versatile, but is not needed for bending regular steel tube. This comes with everything you need except hydraulics. Add the economical air/hydraulic ram and you will be ready to bend tube with compressed air! This is EXACTLY the same machine, except the tradesman set has 5 dies from 1″ to 2″ in 1/4″ increments. It includes the best bend radii for most projects. The only reason to get this package is if you need these 5 sizes (or something close, we allow substitutions), and you want to buy it all at once to save about $140. This is again the same bender as #1 and #2 above, and still available with many options. This time you are getting 11 die sizes and a cart with the machine. It also comes with hydraulics to power the machine, and an option to add our VersaNotcher tube cutting system. This is truly one-stop-shopping, and has a very generous discount built in, along with many accessories and consumables. For around $2K, you can bolt on an industrial 250 volt 9.5 degree per second power system with automatic stops. Compatible with the M600/M600xHD. Not compatible with the TWA, but you can swap to the air/hydraulic system in about 5 minutes for use with the TWA. 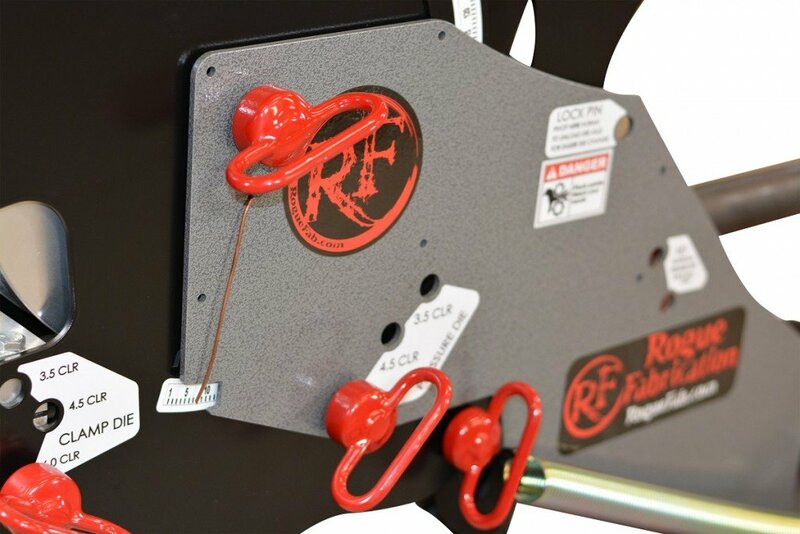 This $375 subframe extends the thin wall capacity of any machine you add it to. It can be added later, so don’t worry about buying it with your initial bender purchase. It is compatible with both the M600 and the thick frame version, the M600 xHD. This may be required to use a mandrel attachment in some applications. These handy tools tell you when you are rotating the tubing in between bends, or possibly even more importantly – when you aren’t! They are cool, useful, and you can always buy them later. You don’t need them to tell you when you have bent a tube to 65 degrees, that is accomplished by the degree indicator that comes with every bender we sell, it is part of the frame. This is a nice roll around cart for the M600/M600xHD. Made right here in our shop from over 60 lbs of steel. This is a super-nice roll around cart for the M600/M600xHD. It is just like the tradesman, except it has more features like ball bearing slider drawers, more shelves, etc. Made right here in our shop from over 70 lbs of steel. This bolt on attachment makes putting repeat bends in the same place very easy. Works with the M600/M600xHD. This bolt on attachment makes any recent M600 tubing bender a true mandrel bender. See the listing with our tubing benders for complete information. DRO (digital read out) for bender. Our team has the experience to get you the right dies for the correct OD (outside diameter) and CLR (Center Line Radius, or “bend size”) with your tubing bender. (rock bouncers, buggies, exo cages, in cab cages, Jeeps, Toyotas, etc): Go with a 1.75 (1 3/4) OD tube die. You will be using .120 wall, and it will look best on a 6″ CLR (bend radius) die, but can be done on a 4.5 CLR with more deformation. 1.625 (1 5/8) x .083 is the tubing most of the NHRA specs are based on, but you will have to get your rulebook to determine all the sizes you need. For example, the 25.3 SFI also uses 3/4″, 1″, 1 1/8″, 1 1/4″, and 1 1/2″. Get a 6.0 CLR for all sizes that you buy over 1.25 OD to be able to bend to the thin wall tubing used. Remember that the rule books list minimum wall thickness and minimum diameter, you can always go bigger and thicker and pass an inspection, which can allow you to buy fewer dies to complete a project. The NHRA handbook covers cars 8.50 second ET (elapsed time) in the 1/4 mile and slower, and that is free from NHRA online. Faster cars are covered by the SFI foundation, and the specs are not free (you can purchase them from SFI). SCCA/NASA specs vary widely based on racing class and car weight, with 1.625 (1 5/8″) OD tubing being the most common. Some cars are allowed 1.5 (1 1/2) OD, and some require 1.75 (1 3/4) OD. The specs are available on the SCCA and NASA web pages for free. Follow the same CLR guidelines as NHRA/SFI above. (Ultra4, Trophy Trucks, Baja 500/1000, other racing series): Go to the SCORE web page for more info. As of 6/5/17, cars over 4400 lbs race wieght has to use 2.00″ OD tubing and .120″ wall minimum for the primary cage structure. We only offer 2 inch dies on a 6 inch radius, which will bend .120″ wall. (sand rails, dune buggies, etc): These are not generally regulated in any way. We have a calculator for tubing that can help you compare materials, and keep in mind this is your safety on the line. Light is fast, and light and fast can be dangerous. These projects vary from lightweight VW powered machines to 1000+ horsepower LS powered cars. On the small side for lighter and slower projects, 1.5 x .095 may be enough (use a 1.5 OD x 6 CLR die). On heavier and faster projects, 1.75 x .095 is a good material to consider (1.75 OD x 6 CLR die). Save weight on shorter support tubes by buying a second and third die, dropping 1/4″ and 1/2″ off your primary tube size. Recommended dies are 1.5 OD x 6 CLR, 1.25 x 4.5 CLR, and 1.0 x 3.5 CLR. We recommend using the same OD that was stock on your side by side so that the cage can use all the bolt on stuff that came with it (mirrors, belt mounts, fire extinguisher, lights, etc). This is 1.75 OD for nearly all side by sides, with the exception of the Can-Am Maverick, which is 2.0 OD. We recommend a 6.0 CLR die for both of these materials. Popular support size is 1.25 OD and we recommend a 4.5 CLR die for this application. If your build is recreational (not covered elsewhere in this section), we recommend 1.75 OD for cars over 3500 lbs, 1.625 (1 5/8″) for cars over 3000-3499 lbs, and 1.50 OD tubing for cars under 3000 lbs. We are not liable for decisions you make on your build. This is just a guideline to help you learn. Wall thicknesses vary, and are common in .120 and .095, and sometimes include .083 (.083 is usually 4130 alloy). Please keep in mind that cages and helmets usually go together, and you will want to pay attention to how far you’re putting metal from the driver’s head and how you plan to prevent a head injury if the driver will not always be wearing a helmet. Most of our customers use 1.75x.120 wall, your choice on a 4.5 or 6.0 CLR die. The OEM cage on the TJ/LJ is 2.125 (2 1/8″) OD. Jeep used this large OD in an attempt to compensate for the severe lack of tubing and triangulation present on the stock cage, as well as all the unsupported bends. The stock roll cage is woefully inadequate in many offroad rollover situations, but can be heavily reinforced/reconstucted to be safe if done right. 1 1/4″ schedule 40 pipe is the most common material, in steel, stainless, or aluminum. This comfortable size meets construction codes in most areas and is very inexpensive. You can use a 4.5 or 6.0 CLR die. This material is 1.66 OD. Sport boats have wake towers built out of 1.50 pipe (1.90 material… pipe, not tube) most of the time. Aluminum is the material of choice. Get yourself a 1.90 x 6 CLR die from our range of pipe dies, and get pressure rollers or UHMW pressure dies so you can bend aluminum. Fishing boats and other pleasure boats frequently have rocket launchers, fishing pole racks, bimini and bikini tops, T tops, etc. These can be made out of anything, but 1 1/4 aluminum pipe is the most common, since it is affordable and won’t rust. That material is 1.66 OD and is best bent on a 6.0 CLR die. Yachts are a little more common to use stainless over aluminum, usually 316L alloy. Pick a big radius for your die when bending stainless (the biggest we sell for your OD). Engine room and bow railings and other railings for human safety and comfort are commonly made from 1.25 OD .065 wall tubing, which bends beautifully on our 1.25 OD x 6 CLR die. 1 inch .065 is used on these craft as well, and it bends great on our 1.0 OD x 4.5 CLR die. 1. Insert tube in machine, tighten bolts to clamp tube. Hook up machine to compressed air source. 2. Open valve (like flipping a switch). 3. Machine bends tube up to 96 degrees, at which point you release the valve to stop. 4. Remove pin from ram end, allow springs to return ram to closed position, and re-insert pin in next hole for the ram. 5. Go back to step 2 (using the next holes) to bend to 145 degrees. A third cycle will take you beyond 180 degrees. 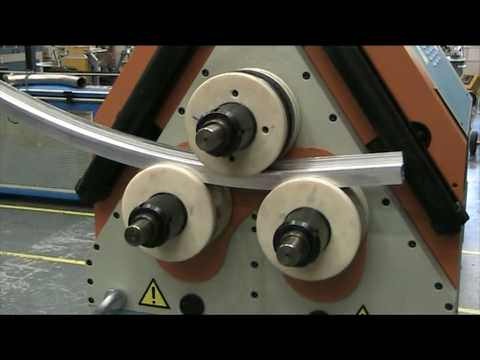 Although not a video of typical use, this video does show how the machine operates. It is a video of us bending some really heavy wall tubing and some solid bar. We have a bunch more videos, just click on “videos” in the menu at the top of this screen. PIPE is a vessel, intended to carry fluids like natural gas or water. They are rated for pressure, not bending strength. Pipe measurements are based on the inside diameter (ID), not the outside diameter (OD). The pipe measurement schedule has evolved and sizes no longer match ID or OD. For any pipe size, you must look up the diameters on a pipe schedule to find out the OD and ID. For any nominal pipe size, the OD will be constant when you change wall thickness. So a 1.25″ schedule 40 pipe is 1.660″ OD with a .140″ wall. A 1.25″ schedule 80 pipe is 1.660″ OD with a .191″ wall. Pipe is generally less expensive and weaker than tube of a similar size. TUBE is a structural member and it is rated for strength. They are sized based on OD, and they are consistent. A 1.5″ .120 wall tube” is actually 1.500″ OD and has a wall thickness of .120″. Tube is more expensive than pipe and has significantly better material properties. We recommend tube for all applications, but understand that sometimes pipe is convenient, functional, and safe. That is why we make dies for both! We have recommended wall thickness ranges for all of our dies. We ONLY test DOM steel, in 1020 alloy on our tube dies. We ONLY test ASTM A-513 Grade B pipe in our pipe dies. We do not recommended you ever buy the cheapest material you can find and expect it to bend as well as DOM steel. DOM is coontrolled tightly in terms of metallurgy, tensile strength, and dimensions. We could test lower grades of material, but due to the high variability of those materials, the test would not prove much. For these reasons, we gurantee our machine on DOM and A513 Pipe only, and we will happily work with our customers who are having issues with any other material. 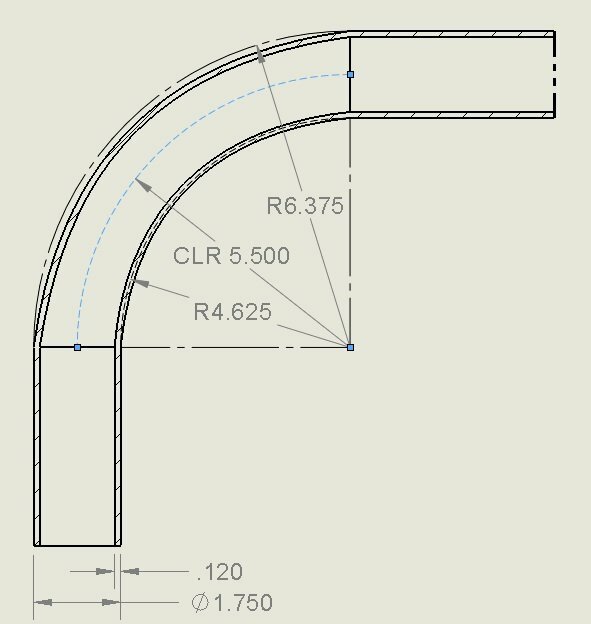 Just please keep in mind that you may need to be flexible on what radius or wall thickness you chose if you are bending a material that is not DOM. For all of these reasons, we are happy to offer to material test bending service (see products/tubing benders). CLR stands for Center Line Radius. It is the industry accepted method for measuring the size of a bend. An example of a small CLR is pipe fittings for plumbing. A large CLR example is the large hoop that makes the outside of a trampoline frame. CLR is measured from the center of a bend to the center of the tube or pipe being bent. Look at the image below for clarification. The 4.625 measurement is the inside radius, and the 6.375 is the nominal outside radius. You can see that the outside radius is actually outside the tube in this drawing. The outside of the tube will naturally pull inward a slight amount from the tension caused by bending without a mandrel inside the tube.